Battlefield V players who login to the game between December 18, 2018 and January 3, 2019. A classic shotgun. An equally classic assault rifle. They’re both waiting for you. As the holiday season is closing in, so are good-old, awesome traits like kindness and generosity. We see this daily – all year round, in fact – on the Battlefield™ V servers as countless Buddy Revives are made and resources shared. As part of the Battlefield™ community, you’re constantly giving us gifts in all shapes and forms: be it feedback, fan art, or frantic gameplay videos. We wanted to give you a little something back. 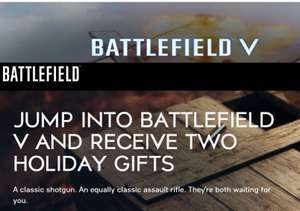 That’s why all Battlefield V players who login to the game between December 18, 2018 and January 3, 2019 will have the Ribeyrolles 1918 assault rifle and M1897 shotgun added to their arsenals. Simply log in to Battlefield V during this period and the Assault class and Support class weapons will be available to equip via the Company menu. You may remember the Ribeyrolles 1918 from Battlefield™ 1, where Assault players got to play with its select-fire capabilities. 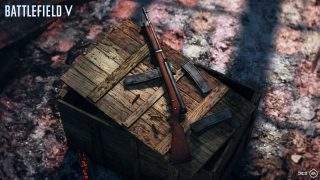 In Battlefield V, it’s a unique piece, thanks to its integral bipod, and with best-in-class accuracy, the assault rifle with the highest range at the cost of some raw damage output. Popular in both World Wars, the M1897 was an American trench gun that proved to be so effective during WW1 that the German Empire protested its use. 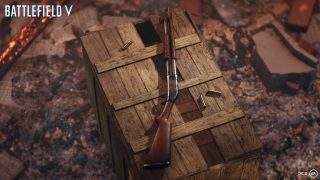 Its Battlefield V incarnation is available for the Support class, and will feel like a true pump-action shotgun with a good one-hit kill range. Learn about all the other weapons available in Battlefield V.
Enjoy these giveaways. If you should miss this offer, you’ll be able to purchase these weapons for Company Coin, the in-game currency of Battlefield V which you earn by playing the game. Such an awful attempt to be funny. Made me smile at least (unlike your comment). Do I need to send evidence of a firearms licence, or will they just post them out to me once I purchase the game? Do I need to send evidence of a firearms licence, or will they just post …Do I need to send evidence of a firearms licence, or will they just post them out to me once I purchase the game? Na, it reduced in price on purpose.. The more players and more people to buy the add-ons.. Oops but Battlefield 4.. Job done! Much better than BF1, but I wish the menus weren't so poorly designed. Definitely have more fun playing with friends in a squad rather than solo.